Hiya! I'm back... Sadly, I've not been drowning under the weight of my books. I've been up to my eyes with work, including the annual conference of the Australasian Religious Press Association where, I'm very chuffed to say, the magazine I edit at work - Parish Connections - picked up an award in the category 'Best Review of Another Medium' for my review of The Blake Prize for Religious Art in last October's issue. So, I'm more than a little bit chuffed. Having a work/catch up day at home as I have an assignment to get done and submitted by this afternoon, and all the usual just-back-from-being-away confusion to sort out. However, having traveled - the conference was in New Zealand - I was made aware again of peoples' reading habits and the growth of various electronic reading devices. Me, I had my books and knitting, but I was surrounded by iPads and Kindles. 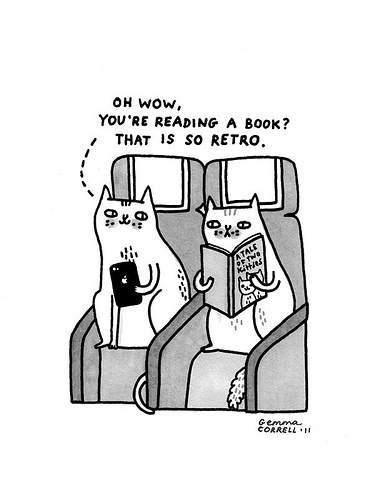 And this morning, posted by the History Teacher on Facebook, I found this and had to laugh...and yes, if reading actual books means I'm retro, then what the heck, I'm retro and proud! !